Airship Ventures: Zeppelin Pilots Needed! Our designer, Matthew, came across this funky website recently when he was surfing and got such a laugh out of it that he forwarded it to us. Apparently the sultanate of Okusi-Ambeno has five Zeppelin NT07’s flying for transportation and tourism. As you will see from their job openings, they also need ground crew. 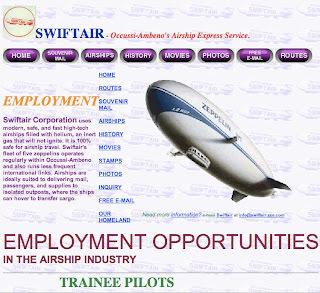 Not much information about the person who decided to put this site up, but he’s clearly an airship afficionado and we suspect he’s the guy in the Fez on one of the pages. The main site is more than 10 years old but showcases a gorgeous collection of airship related stamps, covers, postcards and airship imagery. If any airship fans out there have further information about the genesis of this site, or if it's yours, please let us know. We really enjoyed it.